Pakistan has witnessed a rapid increase in the population from 33 million at the time of independence to around 200 million in 2016. Rapidly multiplying human numbers are not only affecting health care programs, but are diluting the modest gains made at all levels of the socio economic development. High population growth rate contributes towards environmental damage, pollution, social inequalities, low standard of living, high crime rates and low literacy rate etc. We are bound to become victim of demographic debacle, if concerted and meaningful efforts are not undertaken to bring the population at sustainable level. The provincial government has acknowledged the consequences of high population growth rate on economic and social development. Under the visionary leadership of Hon’ble Chief Minister, investing in education and health sector including reproductive health is high on the developmental agenda of the elected government. After 18th Amendment, Khyber Pakhtunkhwa was the first to take practical steps for complete ownership of the program Family Planning Services has been expanded and training institutions strengthened. More than 3000 employees were shifted from PSDP based budget to current side. In addition, since 2011-12, the province has been allocating funds from the provincial ADP to supplement the regular activities of population welfare department. 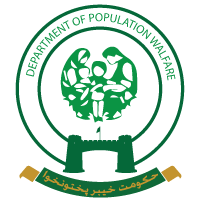 Population welfare department is committed to increase Contraceptive Prevalence Rate (CPR) and bring down the Total Fertility Rate (TFR) in the province through several ongoing innovative schemes. Though provincial government has been spending sizable funds to upscale and expand Family Planning and Reproductive Health Services and is committed to continue provision of required funds, however achieving the Family Planning 2020 (FP 2020) goals and Sustainable Development Goals (SDGs 2015-2030) cannot be achieved single handedly by the government. I expect the Federal Government, Donors and Non-Government organizations to support the government achieving its endeavors and making achievements of these goals happen sooner rather than later.